RECORDINGS on DVD and CD. ORDER YOURS NOW. 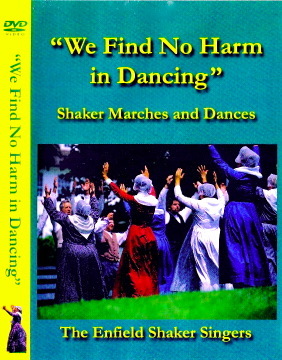 "We Find No Harm in Dancing," gives both an artistic impression and scholarly information on the dances practiced by the Enfield Shaker Singers. The DVD consists of a 20 minute presentation, with excerpts of the dances and commentary by Mary Ann Haagen, the group's director; this is followed by complete performances of 19 dances, with detailed source information. 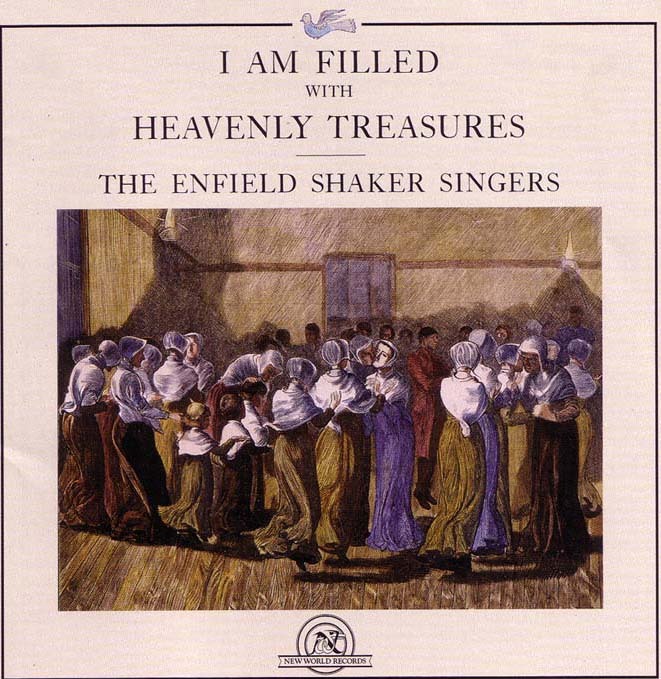 About the CD: "I Am Filled With Heavenly Treasures"
The recording represents 80 years of Shaker musical creativity. Songs from the Bishopric of New Hampshire predominate, but pieces from many other Shaker societies are represented. Only 3 of the 40+ tunes are currently available to listeners. The selection of songs reflects music's many functions in Shaker spiritual practice. The four part hymns on the CD were published by the Shakers in the late 19th century. Most of the single line melodies, and examples of their earliest efforts at part writing were selected from manuscript hymnals and transcribed into standard notation. With several pieces our director has continued a late 19th century Shaker practice of creating 4 part harmonizations for previously received single line melodies. My commitment to Shaker music is rooted in my fascination with the essential role it plays in the creation and sustenance of community. Its power and originality is embedded in its usefulness. It is an American folk music that originated in a specific utopian vision, but it resonates simply and honestly with timeless human yearnings and joys.